Last night Sari & I went to see the IMAX 3D version of The Hobbit: The Desolation of Smaug, at the AMC Loews Lincoln Square on 66th Street and Broadway. We were witness to an incident there that will prevent us from ever patronizing that theatre again. The film, whatever its merits, was an assault on the senses from the get-go, with the pitch-dark theatre periodically lit up by strobes of light and the volume turned up to “eleven.” It continued unabated for close to three hours. Well into the second hour, we noticed a commotion in the row in front of us: some poor guy was having a seizure. He was convulsing violently and obviously in great distress. The people in the seats around him were understandably agitated, some cringing from him and others seeing what they could do to help. One man in the row in front of him stuck something in the guy’s mouth, presumably to prevent him from biting his tongue. Someone called security. A woman in the audience—apparently a nurse or doctor—came down and began attending to him. Meanwhile the movie continued to play in all its raucous fury. Finally a couple of theatre employees arrived, checking the guy out and talking on their headsets. By this time, the seizures had stopped, but the victim was slumped all the way over in his seat, barely conscious if at all. We were horrified to see that the movie was continuing; in fact, many people had turned back to the screen to watch the further adventures of Bilbo and the dwarves. Sari and I approached the people in charge and asked why they couldn’t suspend the movie and put the lights up to properly attend to the victim. They replied that the EMTs were on their way, that “his airway was clear and he was stable.” (I didn’t know one of the criteria of managing a movie theatre was to be a qualified medical professional!) We reiterated our question as to why they couldn’t stop the film to take care of him, and the manager said that once you stop a 3D IMAX film you can’t start it again. (Does anyone know if this is true?) Needless to say, I was stunned by this response—she was implicitly acknowledging that the fear of having to refund 500 tickets was more pressing than the health of a human being in need. By this time, we had learned that the victim was 24 years old and had a recent history of seizures, but had not yet been diagnosed with epilepsy or any other condition. You could argue that, knowing his history, he probably shouldn’t have gone to the film—particularly an immersive 3D IMAX presentation. But the fact of the matter is that he was there, and this was happening. And I couldn’t help but put myself in his place—confused, depleted, in pain, and being treated so worthlessly that they couldn’t bother to stop a frickin’ movie to attend to him. A few minutes later the EMTs arrived, along with some cops. We followed them into the screening room as they attended to the victim. Again, the film continued, uninterrupted! The people in the row alongside the patient cleared out to allow the EMTs to examine him. The EMTs were forced to do this with flashlights, screaming into his ear to asses his condition. One EMT clenched a small flashlight in his teeth so he could use his hands to do an examination. Finally, four of them picked up the guy and awkwardly carried him out of the theatre—with the same EMT clenching the flashlight in his teeth as he helped carry the semi-conscious patient. It was a ridiculous and infuriating scene. There was no way Sari and I could return to watching the film. It’s one thing to suspend disbelief for a few hours. But when harsh reality bursts that bubble, there’s no retrieving it. At least not that night. I’ll never forget my last look back at the screening room we had been in: all eyes (wearing their 3D glasses) had turned back to the carnage on-screen, real life dispelled once again. 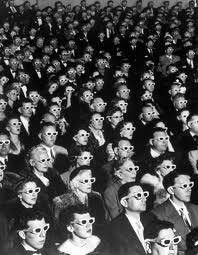 It was exactly the same image as the cover of Guy DeBord‘s famous book Society of the Spectacle. Hey, so I got this idea from a Tumblr post by actor James Urbaniak from some months back. Basically, someone sent an email around asking for help identifying an obscure movie they had seen when they were a kid. The poor person had tried Amazon, cult film fan sites, and even the guy who ran the famous L.A. video store, Jerry’s Video, with no luck. Well, Urbaniak posted it and within minutes someone identified the film: Psychomania. I have a similar dilemma. Some time in the mid-1970s (I would say 1976 or 1977), I saw a Western movie that left an impression on me. One character I distinctly remember is a young gunslinger everyone called "the Punk." He had a bad attitude and even shot a few guys during the film. I remember a scene where the streets of a town were inundated with mud, the only reprieve being a series of shoddy wooden "sidewalks." Like the other memory-impaired film buff, I’ve had no luck tracking down what movie this was. For a while I thought it was Robert Altman’s 1971 anti-Western, McCabe & Mrs. Miller. Some of the scenes seemed familiar, and there’s a young outlaw called the Kid in it. But I saw the film again recently, and it doesn’t feel to me like it was the movie I’m thinking of. On the other hand, I’m quite to prepared to be told I imagined the whole thing. After all, I was only about ten years old at the time. Anyway, I thought if I put it out there, maybe someone on the interwebs will know the film and identify it for me. Do you ever feel like your head is being colonized by Hollywood? Last night I had a fever dream which started out like The Big Chill, featured an interior exactly like Harrison Ford’s Chicago hideout in The Fugitive, and starred a character from David Milch‘s failed series John From Cincinnati — which I have never seen!